Barring an historic March, winter 2017 will be a forgettable year for some area businesses that rely on revenues for snow removal services. “It’s the worst year ever,” Wendy Zendek, of Lucketts Excavating, said with a laugh. Thankfully, she has kept her sense of humor in a winter that has seen her company’s trucks called out only six times. “Which is devastatingly low,” she said. Snow removal services are not Lucketts Excavating’s primary line of work – it does excavating services as well, hence the name. However, it has for the past 11 years been under contract with the Dulles Greenway to plow its on- and off-ramps, as well as the Main Toll Plaza, so the revenue for that contact in a stormy winter can be significant. With the trucks staying parked most of this season, though, Zendek said they have stayed busy with excavating work. Clear forecasts have kept the landscaping side of the business busier than in most Februaries, which has helped. The Blake team is clearing dead trees along the Dulles Toll Road and designing landscape projects earlier in the season than most years. On the flip side, those in construction industry are rejoicing over Mother Nature’s mercy this year. Capital Rail Constructors, the consortium of contractors building Metro Silver Line’s extension into Loudoun County, budgeted for 45 inclement weather days as part of its multi-year construction schedule. The balmy winter will likely not fast-forward the rail line’s opening date much, still slated for 2020. Town of Leesburg public works staff is also counting its blessings this year. Renee LaFollette, director of the Capital Projects and Public Works Department, said the lack of snow is helping her staff chip away their to-do list that otherwise they wouldn’t have been able to touch. Concrete repair work, clearing of brush and trees around pond outfalls, and fixing trip hazards on sidewalks are just a few things keeping the crews busy these days. Another positive has been that the warm winter has not impacted the town’s construction projects, at least in a negative way. The renovation of the Catoctin Skatepark, whose opening could have been delayed by a bad winter, is coming along, and the capital projects staff has also been able to start ahead of schedule on the Battlefield Parkway extension off Rt. 15. Thus far, LaFollette estimates that, at most, the town crews have gone through 1,000 tons of salt for the minor ice and snow events that have occurred. Luckily, whatever salt and beet juice road treatments remain from this year can be held over until next winter as the materials do not expire unless they are exposed to moisture. The town was certainly prepared—if not overprepared—for an extreme winter. 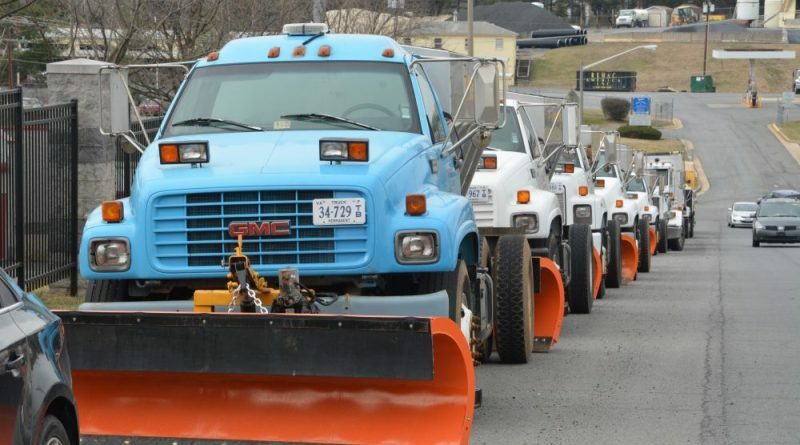 Many in the public criticized Leesburg’s response to snow removal last year following the January storm, with many neighborhoods not receiving a pass from snow plows until a few days after the snow had abated. This year, the town more than doubled the number of contractors it had for snow removal services, and even added an additional $85,000 in the fiscal year budget specifically for snow removal. That money, Town Manager Kaj Dentler said, will be placed in the unassigned fund balance at the end of the fiscal year until an audit is completed. After the audit, council members will be asked to appropriate some of the surplus to the town’s 20 percent reserve goal, while the remaining funds are split in half for the debt reserve fund and the Capital Asset Replacement Fund. The forecast shows a chance of a wintry mix on Friday.